Who needs Latin in this modern, high-tech age? Gardeners do! They need to know Rose of Sharon, Hibiscus syriaca is not a rose which is named Rosa. Rose of Sharon could be a hibiscus. Which rose do you want? Of course, if you want a hibiscus, the Rose of Sharon is a great perennial choice. Knowing your Latin will help you get the rose you want and not a Lenten rose, Helleborus orientalis or a rock rose, Cistus ladanifer. Latin names of a plant can tell us a lot about that plant. Bouncing Bet is a cute name, thought to refer to a laundry woman. Depending on where you live it might be called soapwort, soap weed, or wild sweet William. Its proper Latin botanical name is Saponaria. If you know a little Latin you will know that there is something soapy about this plant, and that it can be used as soap. Add the species name to get Saponaria officianalias and the medicinal use of this plant is confirmed. Cleanliness is important to good health! It was the Swedish botanist Carl Linneaus in the 18th century who created the binomial system of describing and categorizing plants, animals and minerals. It is this system that is used today around the world. Latin was the language used by scholars in those days and it remains the standard of accurately naming plants today. Latin words can tell us where plants originated, and the type of climate that will suit them. Think of Aquilegia canadensis. This native columbine from Canada now grows in northeastern United States, and other similar climates. Baptisia australis, false indigo, originated in Australia, but it is now a loved perennial in many parts of the US. Astilbe japonica originated in Japan. And so it goes with canariensis, africanus, hispanicus, orientalis, sinensis, and other such Latin words. Latin will also describe the shape and habit. Scandens will mean this plant is a climber, repens and procumbens mean a creeping plant. Divaricata means spreading. Phlox divericata is a familiar ground cover. Tomentosa describes wooly with curly matted hairs. The word mollis describes a plant with soft hairy parts, such as Alchemilla mollis which has soft hairy flower stems. All these descriptions make me want to take a closer look at each part of the plants in my garden. I often find it difficult to describe flower sizes and shapes but here is a list Latin terms. Some terms like maxima are easy. Polyanthus means many flowers, and grandiflorus has large flowers. Foetida means bad smelling while graveolens means heavily and sweetly scented. Some descriptions of plant shapes are fairly easy to understand because of the Latin root words which are commonly used. Leaves might be cordate or heart-shaped, serrate or toothed, and lunate means shaped like a crescent moon. We all have favorite colors. Sometimes it is important to know how we are going arrange the plants in our garden and we want to know the color before we buy. Some Latin words for color like alba, and brunnus are easy to understand. White and brown. Others need a little explanation. Lutea and flavum are clear yellow but flavens, flaveola and flavida just mean yellowish. Viridiflora means with green flowers. Glauca means gray or bluish-green, and purpureum means purple. Needless to say I have only touched on the Latin words that are helpful to a gardener who is trying to find the plant she has in mind. I went to the Bluestone Perennial online catalog to check the differences between the many varieties of the popular campanula, also known as bellflower. I found that Campanula garganica “Dickson’s Gold” is four inches tall and makes a matlike ground cover. Garganica tells us that this plant grew at Mt. Gargano in southern Italy. Campanula glomerata “Joan Elliot” has deep blue flower clusters on 18 inch stems and begins blooming in early spring. Glomerata is the word that indicates clusters. Campanula “Purple Sensation” is 14-16 inches tall with three inch pendant purple blossoms. The stunning buds are nearly black. The growth habit is compact and slightly bushy. They bloom from early through late summer. Campanula trachelium “Bernice” is a tall 24 inch bellflower with a flower inside a flower that will bloom from early to late summer. Trach is Latin for neck, suggesting flower stuck into the neck of another . Campanula poscharskyana “Blue Waterfall” is an 8-10 inch Serbian variety described as having a cascading habit blooming into late summer. This is not a complete list of Bluestones’s campanula offerings. I just wanted to begin to show the varieties available of the familiar bellflower and why it is necessary to know the proper name when your gardening friend begs to know the name so she can have one too. Trees have been growing on our planet for about 390 years, in what is called the Middle-Late Devonian period. Those trees did not look much like the trees in our woods today, but they did meet a definition that paleontologists use describing a tree as a plant with a single stem that can attain larger heights because they have specialized cells. Trees were small back then. Nowadays we know how big the family of trees has become, and how big the trees have become. As recently as 2006 a coast redwood, Sequoia sempervierens, was discovered growing in Redwood National Park in California by two naturalists, Chris Atkins and Michael Taylor. That newly discovered tree was measured at 379.7 feet. It was forest ecologist Steve Sillett who climbed to the top of the tree and dropped a tape to the ground. A very long tape measure. To prove it we can all go to the National Geographic website or You Tube and search for Steve Sillett Redwoods and see the film. In ancient times, when people depended on agriculture and the forests for sustenance and shelter, they knew the names of the different trees. They created relationships between trees. The Celts considered that the oak, ash and thorn made up a sacred trio with powers to heal. The oak is a magnificent large tree that the ancients held in high regard. Myths consider the oak as the most worthy tree. They associated the oak with the most powerful sacred gods like Zeus and Jupiter. Thor, a Norse god, was related to lightning storms, strength and the oak. Thor even gave our modern world the name of a weekday – Thursday. People in those days believed in the oak’s magic powers which could bring them good luck, financial success and fertility. They certainly appreciated the practical ways that the oak could be used, for construction, and firewood. The acorns could be used to feed pigs. Different groups used oak bark medicinally to treat colds, coughs, fever, arthritis and for improving digestion. They also used oak to make compresses or add oak bark to water to soothe pain. Today there are 58 species of oaks native to North America. The ash tree is the second in the sacred trio. In Norse mythology the Tree of Life, Yggdrasil, which held the nine elements of the cosmos, is referred to as an ash. This tree supports all creatures and represents the cycle of birth, growth, death and rebirth, the forces that make up life’s journey. The ancients used ash leaves to make a tea as a diuretic and as a laxative, as well as infusions to treat gout, jaundice and other ailments. I also read that unicorns were fond of ash trees. I found instructions on how to catch sight of a unicorn. Just carrying ash wood or leaves might do the trick, or you might lie in a bed of ash leaves and cover yourself and wait for the unicorn. It’s clear to me that these instructions would require great patience. Massachusetts has its share of ash trees. We had a row of ash trees on the road to our house in Heath. We saw lightning scars on their bark, proving their power to attract lightning. As a practical note, both ash and thorn, make good, hot, burning firewood. Finally, the third of the sacred circle, the thorn. We use the full name, hawthorn. This tree, Crategeus, is known for its large sharp thorns. However, C. viridis, Green Hawthorn, has few thorns. You can see these thornless trees locally at the Energy Park. The Greeks and Romans associated the hawthorn with weddings and babies. Brides and their attendants carried hawthorn blossoms. These trees were often planted by holy and healing wells in England. Homeopaths consider the hawthorn a powerful medicine and use it for heart tonics. There are many ancient stories about the trees that are familiar to us, like the oak, ash and thorn. However, when we talk about trees today, we talk about their beauty and value to the environment. Trees breathe in carbon dioxide and breathe out oxygen. In forests tree roots help rains seep into the ground where they are taken up into the tree and then release that filtered water as vapor and oxygen. Trees also cool our neighborhoods and cities because of the shade they throw and because their transpiration of water also cools the air. We can treasure parks with large trees and leafy canopies that shade us and cool us during the summer. We can also plan our gardens so that trees will throw their cooling shade on the house, necessitating less air conditioning. During our first winter in Heath the heavy snows blew and fell on our road, sometimes making it impassible, even for the town plows. During our first spring we began to plant our windbreak. We planted several varieties of conifers in three staggered rows alongside the road to catch the snow. This kept our road from being a giant snowbank. The town crew appreciated it. Now we are in town and have borrowed shade from the majestic oak, maple and sycamore that grow on our neighbors’ property. We even benefit from the fallen autumn leaves. Mulch! Compost! Trees give us many benefits. New Year’s celebrations have been with us for a very long time. The ancients have been paying attention to the movement of the sun, moon and stars for at least four thousand years. They were aware of the equinoxes when the length of day and night were equal. The Babylonians celebrated the beginning of the year with a great religious festival in late March, on the day of the vernal equinox. Not all countries or regions of the world marked the beginning of the year at the same time. Egyptians celebrated when Sirius, the brightest star in the sky, became visible. This was also the time for the Euphrates and Tigris rivers to flood and begin the agricultural year. When the sun got out of sync with the calendar Julius Caesar, ruler of the great Roman Empire, added 90 days to the calendar in 46 B.C., and called it the Julian calendar. It was used throughout the Empire. In 1582, Pope Gregory XIII made a slight correction which gives us leap year, and it is the calendar that is used by most of the world. He also established January 1 as the beginning of the year. Christians had already decreed that December 25 was the birthday of Christ. Nowadays, we can watch New Year’s celebrations around the world. Through the magic of TV we can watch many New Year’s celebrations as our world spins and travels through the sky. Fireworks in Australia! Silence and sleepy, icy in Iceland. Both caught on TV. We are all familiar with some of the elements of modern New Year’s celebrations. There are parties, and drinking champagne or other libations, dancing, and singing Auld Lang Syne. Again, through the magic of TV many of us Americans can watch the brilliant Times Square ball fall 141 feet. The thousands who fill Times Square will count down those last seconds that will leave us in a brand new year full of expected and unexpected events. Chapter three begins. “To every thing there is a season and a time to every purpose under heaven.” It does not take us gardeners too many years to learn that there is a time to plant and the time will come when it is time to harvest. There is no point to rushing out on the first glorious day that makes us think spring has finally arrived. If we want a good harvest, we must be aware of the season. We must be patient and we must attend to the needs of the plants until they are ready for the moment of ripeness. “A time to be born, and a time to die.” It is the plants I am talking about here. Seeds and seedlings planted at the proper time will send out baby shoots full of promise. That promise fulfilled, they will die, but they will leave seeds, or more roots and tubers. A new generation of plants will rise. “A time to plant and a time to pluck up that which has been planted.” Here the Teacher reminds us again, that we need to get busy at the proper moment in the spring, and that we had better be ready at harvest time, or it will all have been for naught. “A time to weep, and a time to laugh; a time to mourn and a time to dance.” This year I have wept over the floods in my garden, but there came so many floods that I could only laugh at the relentless rains. When faced with storm after storm I began to turn the flood into a humorous story. ‘Did I tell you about the year I grew toads?’ I did mourn the plants that drowned, but acknowledged that there was time to dance over to the garden shop and try again. “A time to cast away stones, and a time to gather stones together.” When we are digging and preparing the soil for planting here in New England, we will have stones to cast away from the planting beds. But we can later gather those stones to make a path, or a dry stream, or a sculpture. I don’t know how those stacked stone structures survive, but obviously some people do. I think New Englanders often find creative ways of using castoffs of one kind or another. “A time to embrace, and a time to refrain from embracing.” It is not hard to joyfully embrace sunlight, flowering plants all abuzz with pollinators, delicious vegetables, and the colorful blue jays, cardinals and goldfinches flitting through the trees and shrubs. Neither is it hard to sit in silence and feel the peace of the garden. The final verse of Chapter 3 begins “Wherefore I perceive that there is nothing better, than that a man should rejoice in his own works.” I wish all men and women seasons of rejoicing in your garden this year. Today, January 1, 2019 is mild and cloudy, but our year of 2018 began with a snowstorm. Fortunately I have winter interest in the garden with my winterberries and beautiful exfoliating bark on the river birches. February was a month for reading and learning. George Washington Carver helped farmers turn to peanuts, and the world benefits today with Plumpy’nut. It was also a month of learning about trees, caterpillars and butterflies and their importance to our environment. It has always struck me that February is a great month for reading. I wrote about Houseplants. The Greenfield Garden Club planned a great trip to the Lyman Plant House and Stonehurst is snowy, icy mid-March. Spring is in our minds. In April spring is making herself known. Primroses, crocuses and my favorite epimediums. 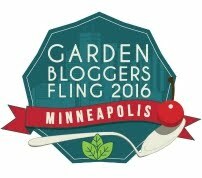 In May the Garden Bloggers went on their Annual Fling, this year in Austin. We saw lots of gardens and at Tanglewild we got to rest in the shade and cool our feet. In June we visited the Seed Savers Exchange in Decorah, Iowa, and then it was on to the Olbrich Botanical Garden in Madison, Wisconsin where Beth Stetenfeld and I caught our breath. In July I spent a lot of time in floriferous local gardens. I bought more daylilies from the Stone Meadow Gardens in Ashfield. You can never have too many daylilies. July – Time to get together with a family expedition to Pickity Place in New Hampshire. Not that far away. August started off the rainy season. The backyard flooded many times. By the time the waters had receded there was another rainstorm and more flooding. The weeping cherry died, and so did the pagoda dogwood. These rains persisted for the rest of the year. In September, Nancy Hazard, passionate about the importance of trees, planted three trees including this tulip trees at the Energy Park. I do my part by tending a small garden at the East entrance to the Energy Park. In October I was invited by Steve Schreiber, Jane Thurber and Mike Davidsohn of Umass to learn about landscape design that was beautiful for the owners and beneficial to the environment. November is for Cider Days! A weekend of delicious apples and education. December is for the anniversary of this blog on The Feast of St. Nicholas in 2008, and the joyous season of Christmas with family and friends. I wish you all a Happy New Year in your gardens and everywhere.